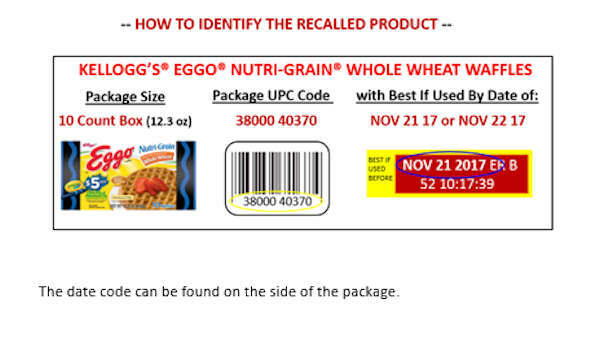 NEW YORK -- Kellogg Co. is recalling about 10,000 cases of its Eggo Nutri-Grain Whole Wheat Waffles because they could be contaminated with the bacteria listeria. Listeria can cause serious and even deadly infections. It primarily affects the elderly, pregnant women, newborns and people with weak immune systems. The Battle Creek, Michigan company said Monday it has received no reports of illnesses. Kellogg says it learned of the potential problem after routine tests. The waffles - available in 10-count packs with "Used by" dates of Nov. 21, 2017 and Nov. 22, 2017 - were sold in 25 states. Other Eggo Waffle flavors and sizes are not being recalled.